Secretary of State Mike Pompeo speaks at a news conference in the press briefing room at the State Department in Washington, Sept. 14, 2018, in Washington. His remarks came after the U.S. accused Russia of altering an independent U.N. report to cover up Moscow's alleged violation of U.N. sanctions on North Korea. "Russia has actively attempted to undermine the U.N. Security Council resolutions," Pompeo said during a news conference, "by attempting to change the language" of a report that evaluates compliance with sanctions against Pyongyang. Pompeo spoke with U.S. Ambassador to the United Nations Nikki Haley on Friday. A day earlier, Haley said Russia pressured the independent sanctions monitors to amend a report that was eventually submitted to the Security Council's North Korea sanctions committee last month. "The United States is as committed as ever to continuing to enforce those U.N. Security Council resolutions. We believe they are central to President [Donald] Trump's efforts to convince [North Korean leader] Chairman Kim Jong Un that full, final denuclearization on the Korean Peninsula is necessary," Pompeo said. Thursday, Washington imposed sanctions on two information technology companies based in China and Russia for supporting Pyongyang's nuclear and missile programs. FILE - Treasury Secretary Steven Mnuchin speaks on Capitol Hill in Washington, July 12, 2018. 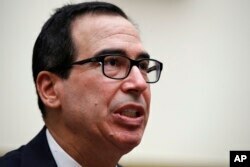 "These actions are intended to stop the flow of illicit revenue to North Korea from overseas information technology workers disguising their true identities and hiding behind front companies, aliases and third-party nationals," said Treasury Secretary Steve Mnuchin in an official statement.